To create his unique ceramics, potter Stewart Scambler delves deep into the Western Australian bush - for inspiration and materials alike. For more than 40 years Stewart Scambler has worked as a potter, and in all that time nothing has informed his work more than his profound interest in the natural world – and specifically the Western Australian environment. First arriving in Perth from post-war Manchester in 1956, the seven-year old Stewart became fascinated by the Western Australian landscape, and spent his youth surrounded by the bush around Kwinana, where his family had settled. For a while it seemed science would be the path he chose to follow – he attended UWA on a Commonwealth Scholarship in the late 1960s – but it was when he began to study ceramics at Fremantle Technical College in 1973 that he found his true calling. Science still had its place in his work, however the analytical and technical aspects of the potter’s craft intrigued Stewart, with his passionate interest in how the world works leading him to build a kiln before he even commenced his art studies. At art school, he was mentored by teachers Heather McSwain (who inspired an appreciation of ceramic traditions from across the globe) and Michiko Love (who introduced students to the enduring forms and principles of Japanese ceramics). Stewart travelled to Japan in 1986 but, unlike many potters from Australia, Europe and America at the time, did not undertake an apprenticeship there. Instead, he was increasingly drawn to making pots that reflected the experience of being in WA. As a result, he developed a working method by which his vessels – in both a material and aesthetic sense – are of Western Australia, with both his clay bodies and the components of his glazes largely sourced from the local environment. Indeed there is minimal use of any commercial or imported material in his pots. In 1993, Stewart also began wood-firing at his property in York, using wood from trees native to Western Australia. It’s an arduous and labour intensive process he describes as a ‘commitment to a lifestyle’, one which involves chopping and stacking wood, and monitoring the temperature and kiln atmosphere over the several days of firing. The kiln can only be unloaded after cooling down for a week, and even then some work requires another firing or further layers of glazing to achieve the right effect. 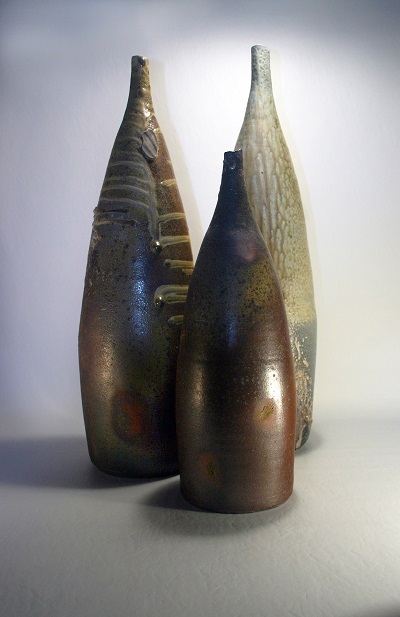 Firing with wood, as opposed to the more predictable results of a gas or electric kiln, means the artist must relinquish some control – Stewart suggests that wood-firing is “a risk, but one I am prepared to take, for once in a while the results transcend what I obtain purely from experience and knowledge”. Thanks to his process and the materials he selects, his pots take on the earthy, muted colours of the local landscape from which they are made. Sustainability and sensitivity to the environment are at the core of Stewart’s practice. His wife Trish (who also works in clay and in design) has initiated a planting program on their property, so that all wood used in the firings is replaced; they plant about 100 trees annually. Travels to the Karijini National Park in the Pilbara and along the Gibb River Road in the Kimberley have inspired his latest body of work, a striking assembly of large-scale sculptural forms and murals. The works capture key features of the landscape, such as the sharp-edged profiles of gorges and rock formations, and the rich, red earth of the North. A selection of these works will be shown at his exhibition, Stewart Scambler: Fragment, on at the Lawrence Wilson Art Gallery until August 18.